Our London Buddhist centre is the longest established Diamond Way Buddhist centre in the UK. Our popular meditation classes have proved highly effective for busy people living or working in London who want to learn to meditate with authentic Buddhist methods. 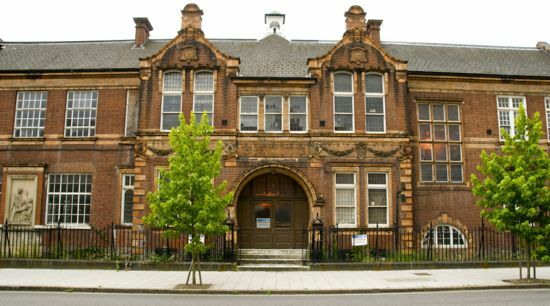 From 1998 to May 2013 the centre was based in Holborn, but as of April 2014 is now located in the former Beaufoy Institute, a Grade II listed building in Lambeth, south London. Our London Buddhist centre offers the same authentic meditations and teachings as before, but in a much more fitting setting. Our beginners’ evenings make it easy for anyone to learn Buddhist meditation in London. Suited especially for those who are new to Diamond Way Buddhism or to meditation in general, the evenings usually start with a cup of tea in the lounge for those who arrive a little early. An experienced Buddhist practitioner then gives a 30-minute introduction to a fundamental Buddhist topic, such as Buddhism in the West or Meditation. The aim of the talks is always on what can be applied in daily life and what is useful to know in order to support our meditation practice. There is the opportunity to ask questions to clarify what was talked about. Then we meditate together for about 25 minutes. We do the same guided meditation on the 16th Karmapa that is done in Diamond Way centres worldwide. This meditation is easy to learn and practice, but is very profound and has a cumulative effect on the mind, leading to greater clarity, calmness and joyfulness. The meditation is guided, so you just need to follow along. We also organise lectures and events by visiting Eastern and Western Buddhist teachers. Lectures by experienced teachers are a precious opportunity to deepen our understanding of Buddhist meditation and philosophy, and their application in daily life. For those who already have or are ready to start a regular Diamond Way meditation practice such as the Four Foundational Practices, we also organise meditation retreats around the country. The London Diamond Way Buddhist Meditation Centre at the Beaufoy is now open! It was opened on Saturday 5th April 2014 by Lama Jigme Rinpoche, Lama Ole Nydahl, and special guests from Lambeth Council and different faith groups and the local community. After local community consultation, the planning application to bring the historic Beaufoy Institute back to life was approved by Lambeth Council on 3 July 2012. In the Beaufoy, Diamond Way Buddhism UK has a fantastic opportunity to bring the Buddha’s teachings to the Lambeth area. For more information on the ongoing project to renovate the Beaufoy and our events and plans, including our beautiful, 1.7m Buddha statue, please follow our Beaufoy Blog. The best way to learn more about Diamond Way Buddhism is to come to our centre. Buddhism, while it has a deep and coherent philosophy, is primarily experiential. There are many kinds of Buddhism for people with different goals, temperaments and styles, and you’ll never know which is right for you without trying. You can also get more information about our methods, our teachers, and our history on this site and on the main Diamond Way Worldwide site. Suitable for those new to Buddhism and meditation or wishing to learn more. Starts with a 30-minute talk on a key Buddhist topic, given by an experienced Buddhist practitioner, and a chance for questions and answers. Followed by a guided Buddhist meditation – 16th Karmapa meditation. This meditation is suitable for newcomers and experienced Buddhists alike.